"Among the churches of America,the Sanctuary of Our Lady of Victory is,for many reasons,to be counted as one of the greatest.This sanctuary is truly a masterpiece,in the nobility of its lines,in the splendor of its marbles,in its massive solidarity,and in its artistic finish..."
Brian Dennehy is a Catholic American actor, winner of a Golden Globe for ‘Best Performance by an Actor in a Mini-Series or Motion Picture Made for TV “Death of a Salesman”. Mr Dennehy was the voice of “Django” in the popular film “Ratatouille”, also known for his various roles in movies such as “Romeo and Juliet”, and “Everyone’s Hero” as the voice of baseball legend Babe Ruth. When asked to recall Father Nelson Baker, many describe a man who was a protector of people and a strong advocate for the rights of the disadvantaged. Others refer to him as a visionary and a shrewd businessman who was able to turn desperate situations around. All remember him as a spiritual leader of incredible faith with a steadfast devotion to the Blessed Mother as Our Lady of Victory. In 1921, at the age of 79, Msgr. Nelson Baker contacted Architect Emile Uhlrich with plans to build a church dedicated to the Blessed Mother, in Lackawanna, NY. It was to be a place of wondrous beauty and radiating hope to all who enter its doors. Emile Uhlrich, born an orphan in Epinal, France, was educated at the Ecole Fenelon, the Lycee St. Nicholas, and the Ecole des Beaux Arts. At age 18 Emile moved to the United States and in 1900 was naturalized. He soon became a successful architect specializing in church design in Cleveland, Ohio. Within five years, the priest and the architect built a church that was a true architectural wonder. Building costs came to $3.2 million, which was paid for before church doors open in 1926. Iron from steel giant Bethlehem Steel and marble from Georgian Marble company would house hundreds of paintings, sculptures, mosaics and stained glass from world renown artists. Today Our Lady of Victory Basilica carries the title of National Shrine and Minor Basilica. It is considered to be Emile Uhlrich’s pinnacle work. And for the priest who started it all, Msgr. Nelson Baker, he has been named Servant of God the first step toward sainthood. 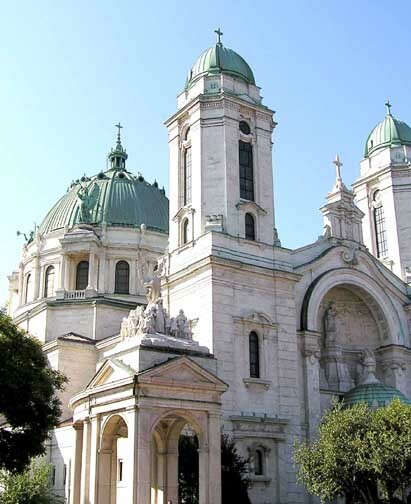 "Building a Basilica" produced by Daybreak TV Productions, Catholic Diocese of Buffalo, tells the story of this national shrine through vast archive materials including drawings and hundreds of letters from Fr. Baker, Emile Uhlrich, builders, artists and contractors.